Originally from Asia, figs flourish on the hot dry Mediterranean shores so you might think that it wouldn’t be possible to grow them successfully in the UK - but you’d be wrong. Fig trees with their large lustrous leaves make an attractive addition to any garden but it’s for the fruit with its rich perfume and sweet flesh that most gardeners will have a go at growing them. Planted against a south-facing wall a fig tree has a good chance of producing a single crop a year but grown under glass it’s possible to get two crops annually out of it. Growing the tree under glass also enables you to choose from a wider range of varieties with improved flavours. Most success is to be had when the fig tree is trained as a fan and its root growth is restricted. If left to itself, the fig tree will react to the climate and conditions in the UK by producing lots of foliage and few fruit. To avoid this it is recommended that you plant the tree in a sunken brick box, 2’ by 2’ by 2’. The box is bottomless but the lowest 6” is filled with gravel to prevent the roots from spreading out. Tubs or pots provide an alternative but bear in mind that the fig tree will grow to be quite large and could easily be blown over by a sudden unexpected summer wind. Keep the tree well-watered in summer when the fruit is forming and feed with a high-potash food e.g. a tomato fertiliser, weekly.When fully grown the tree will need to be pruned every few years to ensure new growth. Any half-ripe fruit left on the tree in autumn should be removed before over-wintering to prevent it rotting and damaging the rest of the plant. Red spiders can be troublesome. Remove by hosing every few days. Be on the lookout for woodlice, which are attracted to the fruit and will munch their way through them if not removed quickly. Use net to protect the fruit from birds. Alternatively use individual bags to protect the ripening fruit. Although time-consuming, this guards against wasp attack too. Young wood may be killed by the winter cold so protect the tree by covering with a straw coat. Ficus Carica ‘Brown Turkey’ is a common variety, popular because it doesn’t need to have its roots cramped. It is less flavoursome though than ‘White Marseilles’, which fruits slightly later but grows well in pots. An earlier fruiter is F.C. ‘Brunswick’. Figs don’t ripen after picking – an important point to bear in mind when buying figs as imported fruit that are going to be transported have to be picked slightly under-ripe When figs are ripe the skin begins to split and they can be plucked easily from the tree. Figs are past their best when they develop a slightly sour smell. Once picked they need to be handled with care as they damage easily. Even stored in the fridge fresh ripe figs won’t keep longer than three days. They’re best picked on a warm sunny summer’s afternoon and eaten fresh from the tree, but if you have to keep them in the fridge, before eating allow them to come to room temperature. 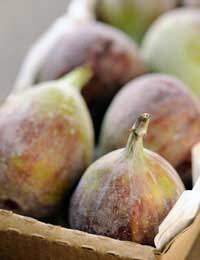 Figs have a very high sugar content making them naturally sweet and they go well with other strongly flavoured foods such as prosciutto or goats’ cheese with rocket. Eat raw drizzled with honey and served with clotted cream or poach in port with a cinnamon stick and grated zest of a lemon for 5-8 minutes. I planted a fig tree in a 20" container this past spring and it's doing very well but is more like a bush than a tree with around 6 strong shoots coming from soil level. Does it need to be pruned as it seems to be more of a bush? Also will it make it through the winter outside? Incidentally its about the only thing in my garden that has not been attacked by snails, slugs or anything else and the huge leaves look beautiful. We're glad you are enjoying your tree. The best time to prune a fig is in winter when dormant (yes, it is fine outside, but as specified in the article cover if the tree is young). You can remove any branches not growing out from your selected fruiting wood. Plus, if there are suckers growing from the base of the tree, you should remove these too. In order to get optimum fruit you will also need to remove any brances that are growing close/parallel to others or too close to the main trunk. They want to be at a 45-degree angle. You can also cut back the main branches by one-third to one-quarter, this will help your tree produuce better fruit next year. I planted a fig tree in a 20" container this past spring and it's doing very well but is more like a bush than a tree with around 6 strong shoots coming from soil level.Does it need to be pruned as it seems to be more of a bush? Also will it make it through the winter outside?Incidentally its about the only thing in my garden that has not been attacked by snails, slugs or anything else and the huge leaves look beautiful.